Welcome to my Kilimanjaro photo diary. With these pictures I can share with you what was most definitely a trip of a lifetime that I will never forget. The scenery was absolutely stunning, from tropical rainforests down below through heath and moorland zones above to the alpine desert, glaciers and ice above. The biggest concern on the trip was that of altitude sickness, with the air pressure at the summit being well under half what it is at sea level. However, with some decent acclimitization walks and not rushing to get up there too quickly, the whole group succeeded in reaching the summit at around midday local time on 22nd September. Wow! We did it! What an epic adventure it was. Now join me in these pages as I describe with words and photos the trip from start to finish. The pictures are mostly in 1024x768 or 1200x600 format, with panoramas being 400 pixels in height. Click on a thumbnail to bring up the full sized picture. If anybody else from the trip would like me to send an original (12 megapixels - 4000x3000) to them then please let me know the file name and I can fish it out of my archive and email it. Koshertreks: The company that I signed up with for the Kilimanjaro trip. Battle at Kruger: The You Tube video refered to during the trip of battle between the wildebeasts, lions and crocodiles. Kilimanjaro The Trekking Guide To Africa's Highest Mountain 3rd Edition (Amazon UK Link) (ISBN: 978-1-905864-24-9): The excellent guide book that I bought before the trip. Even William the head guide thought it was good. Climb Mount Kilimanjaro Website: The official website for the book. Fox's Outdoor: The outdoor shop in Amersham that I bought most of my gear from. Both in store shopping and online shopping are good experiences. The evening before after Shabbat ended, I met up with Yedidya, Susan and Boaz Fraiman as they passed Har Nof, Jerusalem, on the way to the airport. Checking in was a nightmare in a queue that didn't seem to move. But despite that we got away OK and on time somewhere around midnight. Overnight we took 3 flights. The first flight took us on a cosy Ethiopian Airlines 737 to Addis Ababa, Ethiopia. Wow! I've landed in Ethiopia (albeit quite a heavy landing I must note). Never thought I'd say that. Not much to see though as it a cool and a foggy start. A fairly nice modern metal and glass terminal though but not a lot to do. It seems Ethiopian duty free looks much the same as British duty free with all the familiar brands. Plus some Ethiopian scarves and other handicrafts too. The internet cafe was down but we used the comfy seats there to rest for 4 hours until the next flight was ready to go. The sun broke through the clouds too and shone into the terminal, which also helped lift the mood. The second flight took us on a rather uncomfortable Ethiopian airlines 767 to Nairobi, Kenya. This airport was much bigger but not very attractive, looking like a concrete monster. Here we had a 6 hour wait. I felt poorly due to lack of sleep. But it was a gorgeous day outside. Sun almost directly above us, being almost on the equator, but not blisteringly hot. After obtaining boarding cards for the final flight, Yedidya eventually got us into a 1st class lounge with cosy leather sofas, food and drink and internet access. Awesome! We got some much needed rest there to soothe away headaches and stiff necks from travelling all night. Eventually we got onto a Precision Airlines Turboprop. What a cool aircraft! Much more fun than a regular jet. 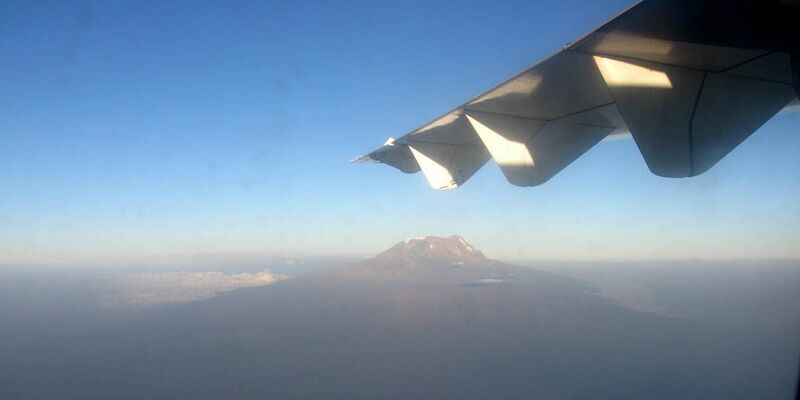 We got a great view of Kilimanjaro as we cruised in at 17,000 feet, just below the summit, as the sun started to set. Oh to have been a few thousand feet higher to peer into Kibo crater itself. 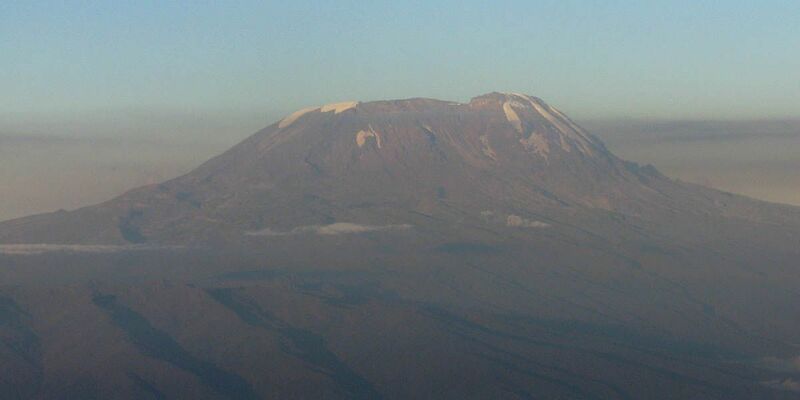 Here are some pictures taken from the aeroplane as we passed Kilimanjaro at 17,000 feet on the way to the airport. Plus a few more pics taken after landing. 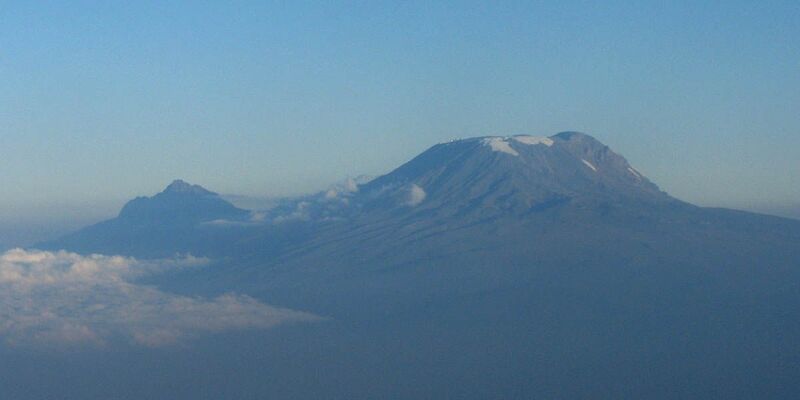 Looking at Kilimanjaro from the Northwest. 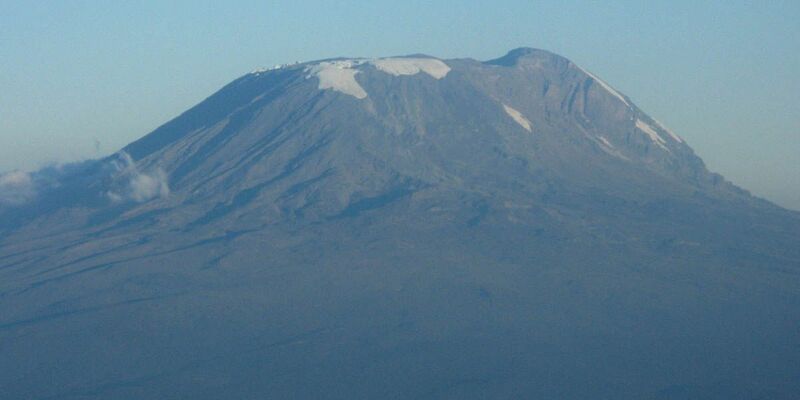 The secondary peak to the left is Mawenzi and the main peak is Kibo. 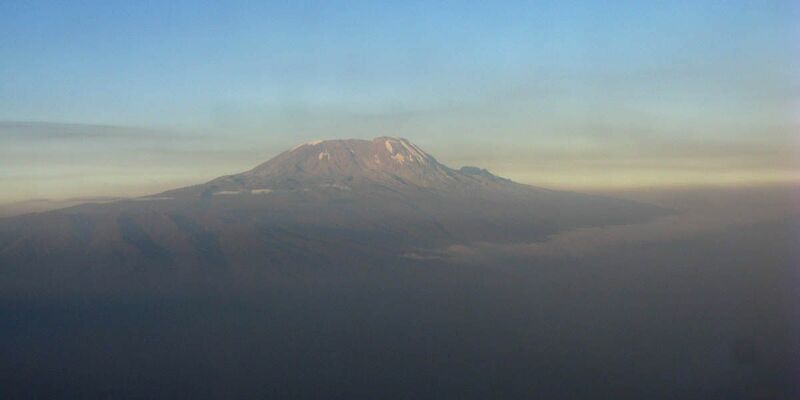 More views of Kilimanjaro as we fly round past the Shira Plateau to the south side before landing. 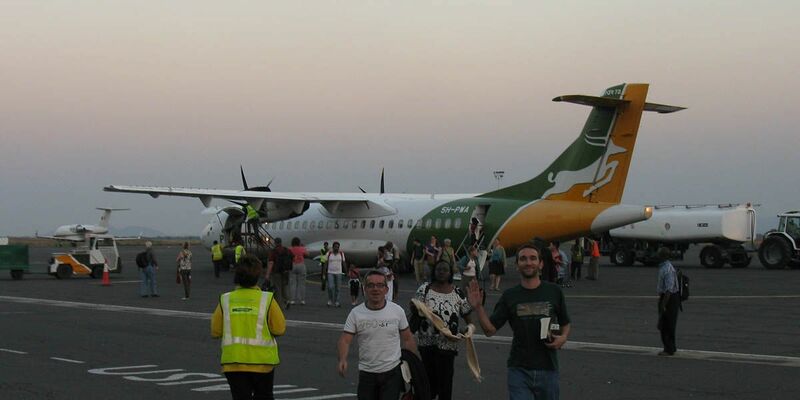 The turbo prop we flew on from Nairobi to Kilimanjaro. What a cool aircraft. Much more fun than a regular jet. 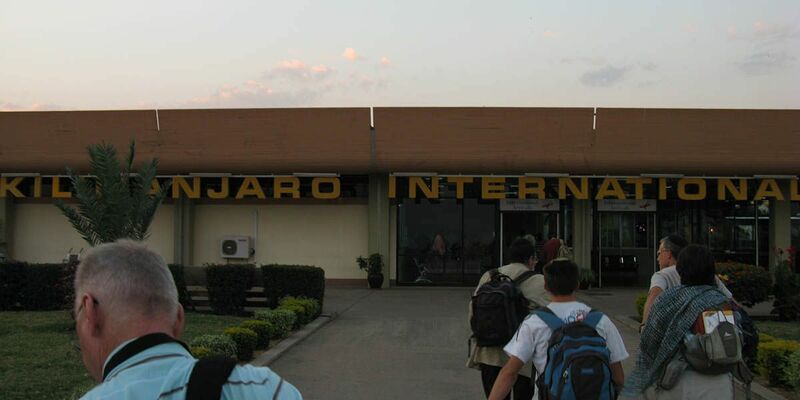 Kilimanjaro International Airport!